A question that we are frequently asked is how to buy the correct sized bike when you are looking to buy used over the Internet. With so many different variations of frames on the market today and a wide variety of ways to measure we’re not surprised that many of our users are perplexed when it comes to sizing, even if they have been riding for years. Some brands offer bikes in Small, Medium, and Large sizing, some use a sloped geometry measurement, some a standard geometry measurement, and still others have their own unique system. So where do you start? When looking for a standard size road and mountain bike there are a handful of useful charts available like the one shown below that will help get you started and pointed in the right direction based on your height, and inseam length. Keep in mind the chart is a rough starting point and if you find yourself in between sizes your inseam length should take precedent. Also remember with the many options for bars/stems and saddles/seat posts you will be able to fine-tune your setup once you decide on correct size frame. Last when looking at a bike brand that doesn’t use standard sizing try looking up the companies website, often times they will have their own conversion chart to help guide buyers. Beyond the sizing chart there are some other critical measurements you’ll need off your old bike (if the fit is good) and off the potential new bike your looking at prior to purchase. If the seller does not have them listed don’t be afraid to ask them to take the following measurements. You’ll want to measure from the center of your saddle to the center of your bars to help determine length and reach. Next measure from the center of the front hub or axle to the center of your bars to get an idea of front-end height, and finally you’ll want the measurement from the center of the bottom bracket to the top of the saddle for your seat height. Once you have these measurements you’ll be able to confidently know if the used bike you are looking at will be a good fit for you before you buy it. When comparing numbers keep in mind your looking for close, for measurements that come within a centimeter or two of each other the gap can usually be adjusted to the correct measurement by using spacers, stems, bars, saddles, and different seat posts. 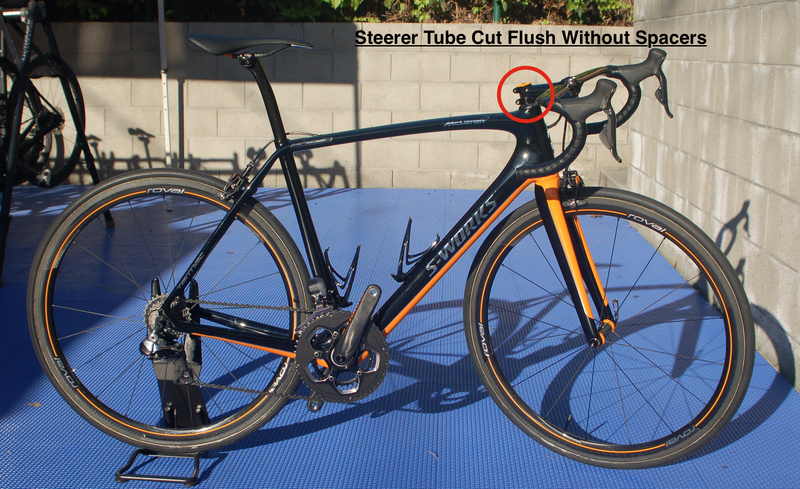 Aside from those three crucial measurements one more important place you’ll want to take note of is the steerer tube length. Many times the previous rider has had the steerer tube cut to fit him or her specifically, and while there are some work arounds with riser stems that can be used to modify the bike fit you can never add back length to a steerer tube after it has been cut, and having your bars at the right height is one of the most important pieces to being comfortable and having an enjoyable ride. This guideline is only meant to get you into the right ballpark for frame size. After a new bike purchase its important to be fit correctly by a professional or someone who has had lots of personal experience bike fitting. When properly fitted you will reduce your chances of injury and ensure comfort while riding.